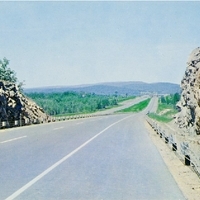 A postcard depicting a view of the Massachusetts Turnpike 4 miles east of the Stockbridge Interchange in Stockbridge, Massachusetts. Construction began on the Massachusetts Turnpike in 1955, but plans for the east-west highway had been in the works for many years. As early as 1805, private companies had built failed turnpikes to facilitate shipping across the state. However, the rise of railroads in the 1830s halted progress on the road system until after World War II, when the highway plan was revitalized in an attempt to cure a stagnant economy. Original 3 x 5 inch color postcard by Colourpicture Publishers, Inc.: ACC# SM-00-243, file folder 1 (U.S. blanks), box 10A, Lucile (Mary Lucile) Campbell Collection, UCF Public History Center, Sanford, Florida. Digital reproduction of original 3 x 5 inch color postcard by Colourpicture Publishers, Inc. Originally created by Colourpicture Publishers, Inc. and published by the Howard Johnson Company. Tsipis, Yanni Kosta. Building the Mass Pike. Charleston, SC: Arcadia, 2002. Colourpicture Publishers, Inc.. “Massachusetts Turnpike 4 Miles East of Stockbridge Interchange Postcard.” RICHES of Central Florida accessed April 19, 2019, https://richesmi.cah.ucf.edu/omeka/items/show/6774.